As Tashkent morphs into a modern Central Asian city, many neighbourhoods are undergoing rapid change. Large apartment blocks are being built in traditional mahallas (neighbourhoods) of single storey homes with courtyards. Sometimes garages - always painted green and often used as storage places - are removed for new construction. New business complexes replace two or three-storey old office buildings. It is the same throughout Central Asia as cities expand and countries develop and establish their own architectural language, throwing off the Soviet model. Talented Tashkent-born painter Eugene Panov lovingly looks at his city. In this charming collection of watercolours, he notes the rhythm of quiet streets: neighbours, courtyards, washing hanging from balconies, electricity poles and gas pipes crowding the streets, old walls, windows and gates in the rain. 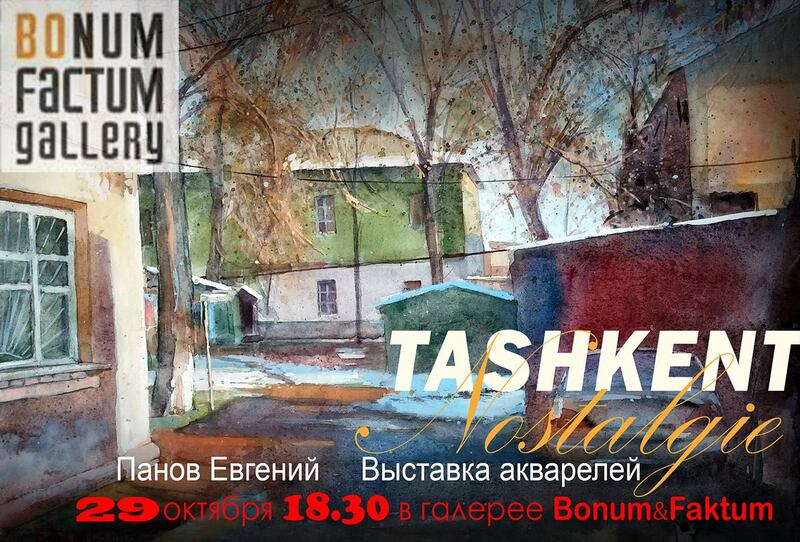 This is the city Tashkent citizens remember with such affection. 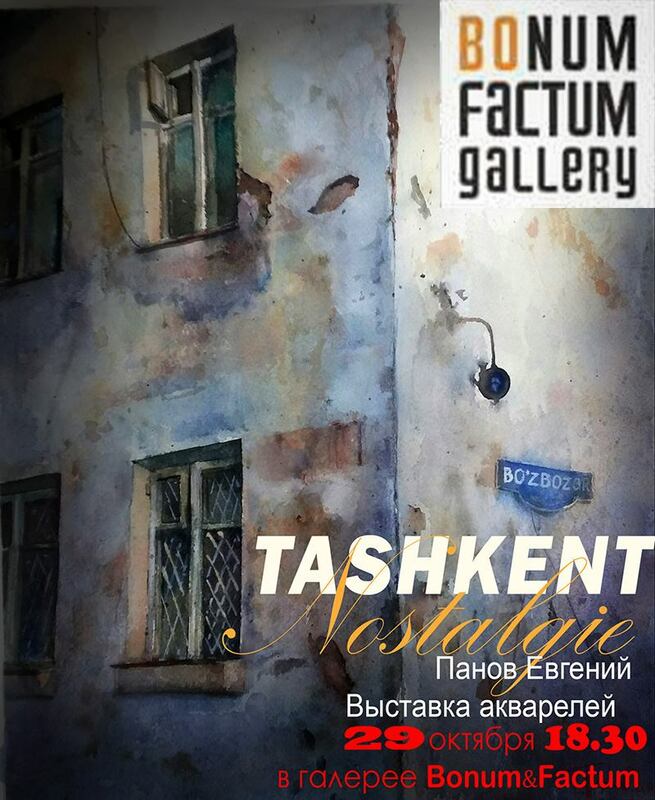 That old Tashkent still exists - but these days it is a little harder to find. 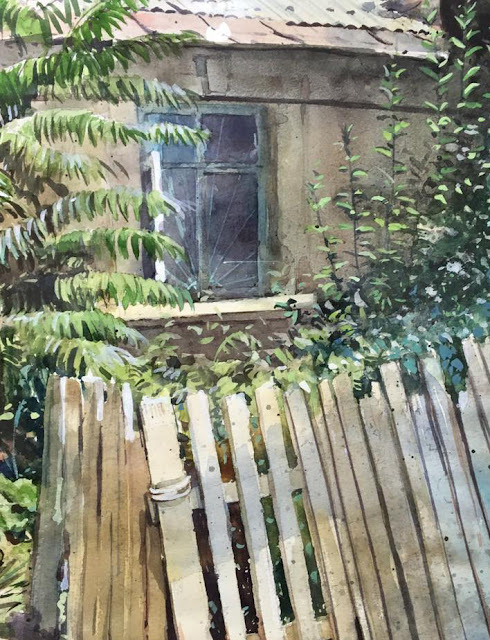 You need to go further from the main streets and peek into courtyards, where Uzbek families still sip tea on a tapchan ( a raised platform, which functions as a table or bed ) and grow roses and basil side by side. 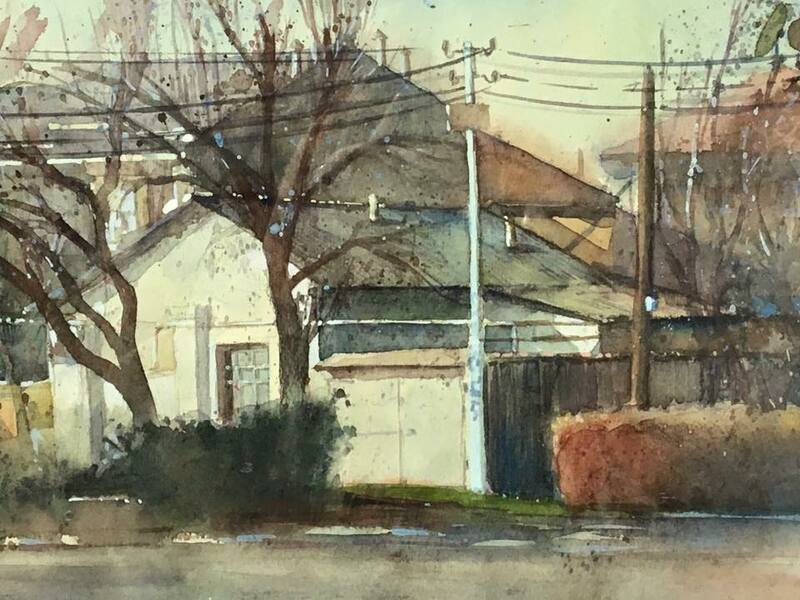 Often old, small apartment blocks share a common garden and play area. 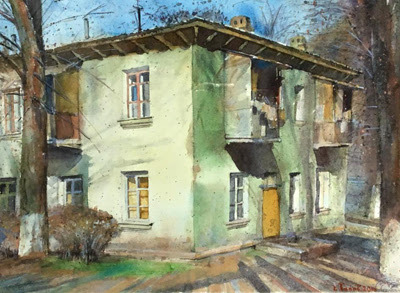 In these places you will hear the morning milk man calling out "молоко" (milk) as he wanders the leafy neighbourhoods. You will come across small bazaars in which you can buy homemade sour cream, kefir and cottage cheese. Or a bunch of flowers freshly picked. Or have your shoes or umbrella repaired. 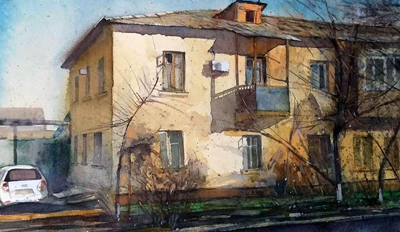 Panov works in many mediums, but watercolour seems just right to reflect this city in transition. Classically trained at the Republican College of Arts named after P.P. 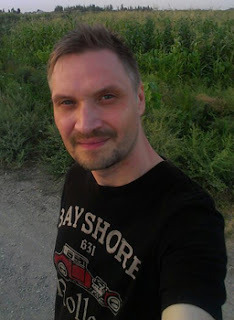 Benkov, Eugene Panov has exhibited regularly and widely, including a solo exhibition in St. Petersburg. This exhibition is at the cool Bonum Factum Gallery until 20 November. 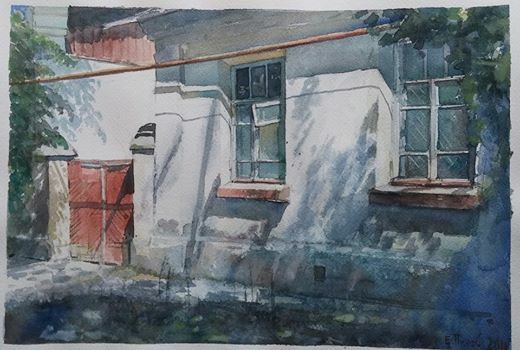 The gallery is located at 20 Sodiq Azimov ko'chasi, Tashkent, near the Japanese Embassy. It is open Monday - Friday, 10:00 - 18:00 and you can call ahead on +998 71 232 03 60. Gallery staff speak English - they can send image files and can arrange postage of artworks. Below is a selection of paintings from the exhibition.